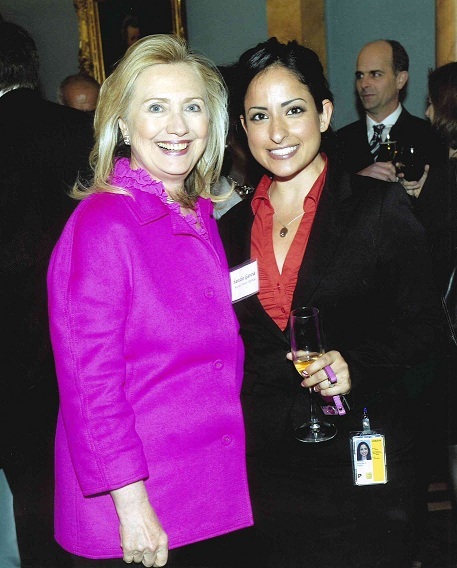 …For me to post my picture with Hillary from the State Department holiday party! Just shooting the breeze and pausing to smile for a picture! 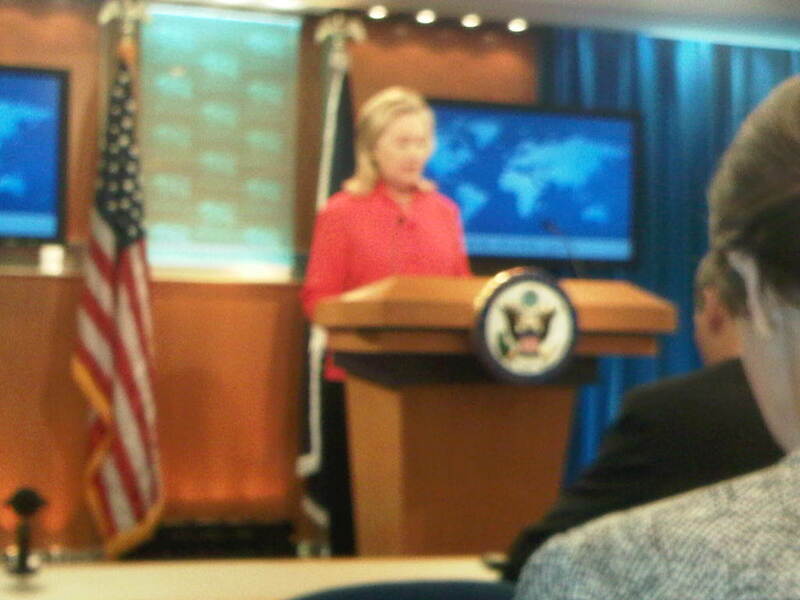 Clinton in the DOS briefing room to release a new report about land mines. 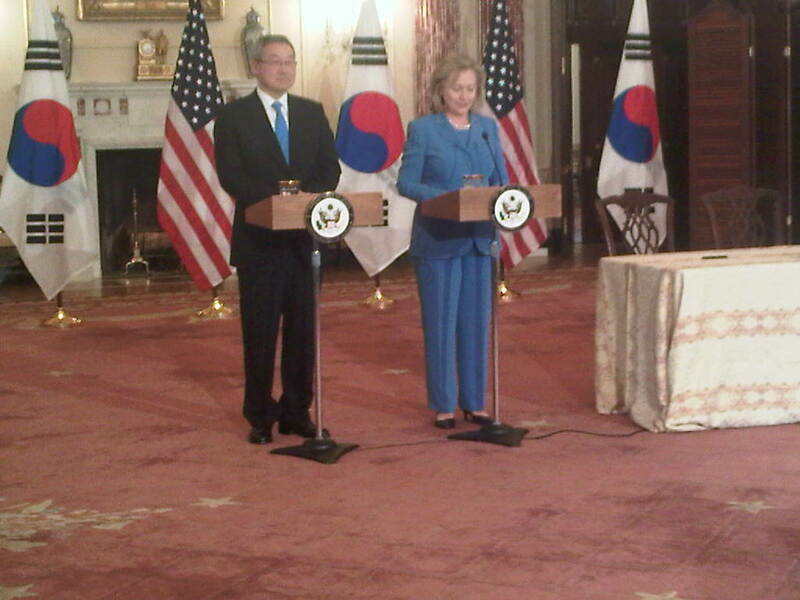 Many who were there were hoping she would address Kim Jong Il's death. 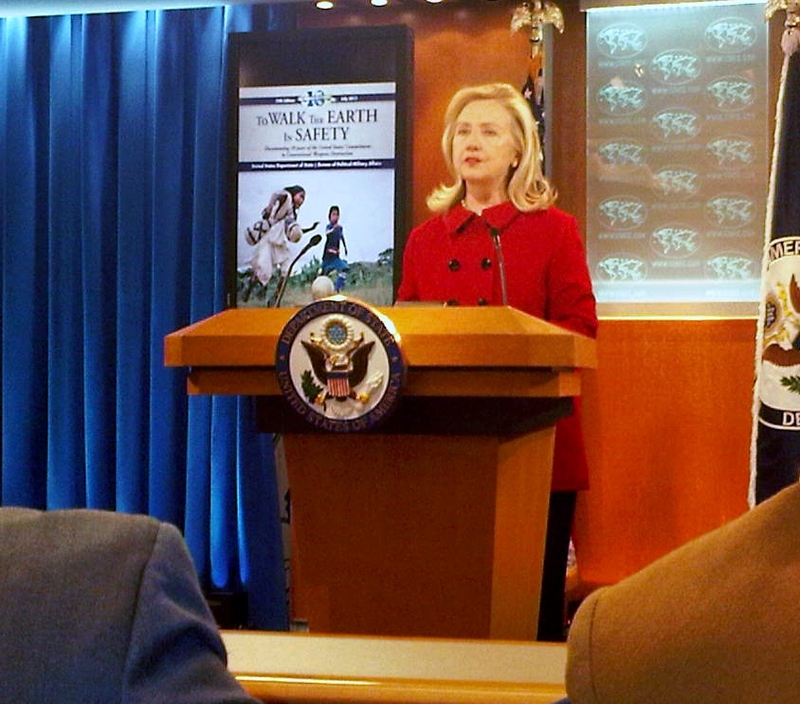 Today I saw Hilly twice- first in this press conference about land mines. Since it was her first open press event of the day, I was hoping that she would address the death of Kim Jong Il, but she did not. 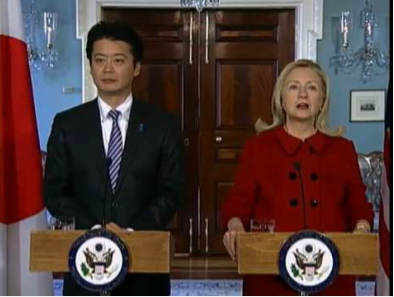 The Secretary and her Japanese counterpart, Foreign Minister Gemba, delivering joint statements after their bilateral meetings at the State Department. After this statement, she proceeded to head to Georgetown University where she gave a speech on Women, Peace and Security, to be followed by a dinner for the members of the Foreign Affairs Policy Board at the State Department. Press-wise, this was definitely a “slow” day for her. Only 6 events and more than an hour in between her last speech and aforementioned dinner! Maybe she took a nap! Or maybe she had tons of internal meetings since she’s been away from the State Department for about two weeks. So as expected, the party was wonderful, the Secretary was wonderful, the atmosphere was wonderful. Shall we start with Hilly? She was radiant in a hot pink blazer, tailored black slacks, flowing, yet perfectly styled, hair, and accenting lipstick. Amazing. This is the pink blazer and flowing hair that I speak of. This picture is from an event earlier in the day where she talked about international engagement in South Sudan. The State Department has these parties every night this week for various departments and bureaus, and she comes, takes literally hundreds and hundreds of pictures, and is friendly, outgoing, and personable with everyone. I was quite excited to meet her. My friend David, who has covered the State Department for 33 years, introduced me and the three of us chit-chatted about his retirement, took a few pictures, and then she was off to the many others vying for her attention. I did however give my card to her “right-hand man”, Philippe, who said he would include the link to this blog in her minutes. 2) You are an incredible business woman, politician, and mother, and an excellent example of what all women should strive for. 3) Although you will be sorely missed after your tenure as Secretary of State, I hope that you take ample time to relax, do nothing, and then, much later, when you’re ready to get going again, write an enormous book about your time as Secretary. I absolutely love the 8th floor. All of the old mementos, furniture, chandeliers were just gorgeous. It never gets old to me. After a little more mingling, I left and gave a full report to my mother, the original Hillary admirer, who was just so happy to hear that Hil as wonderful as she seems. I thought I would update the Secretary’s travels, since I last posted about them in July. Since then, she has racked up even more time and miles. Quite possibly the world’s busiest lady! So today I get to finally meet Hilly! I am very excited, but this is also somewhat bittersweet. As a member of the foreign press, my bureau has a desk in the bullpen (a designated area where all major media can do work in the State Department). Not everybody has a desk there, so one of the perks is getting special conference call invitations, party invites, etc. However I did not get an invite to this evenings holiday event with her. I have called and emailed various offices upwards of 20 times- that is no exaggeration– about a reason for this oversight. Nobody called back at first, then once they saw I wasn’t relenting, the new response was “we don’t know who sends the invites, but we’ll look into it.” Well they’ve been “looking into it” for about 3 weeks now, and of course, I have no answer. Fortunately a member of the bull pen kindly offered to take me as his guest, so while it all worked out, it is still a little stinging. I attend the briefings everyday, I go to all events, and I have a [coveted] desk in the bull pen. The desk should be grounds for an invite whether or not I attend anything at all. It is however, common knowledge that the foreign press does not get the same treatment as American press- not that it makes it any better. Aside from all of this, I have loved and admired Clinton, long before she was the Secretary. It reminded me of a certain similar incident with Dr. Ben Carson many, many years ago. But that’s a different story for another time. So I will attend this event tonight to see one of the most wonderful women in the world, and I am very greatful to my friend David for inviting me as his guest. Here is my lovely Hillary dressed in a beautiful red jacket with oversized buttons discussing the Mid-year report on International Religious Freedom. 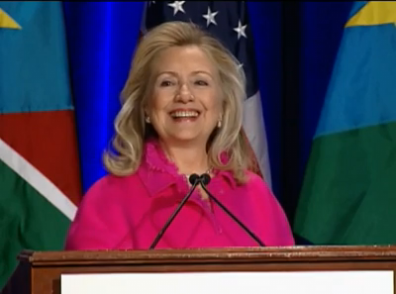 She looked a little tired this morning, but still radiant. 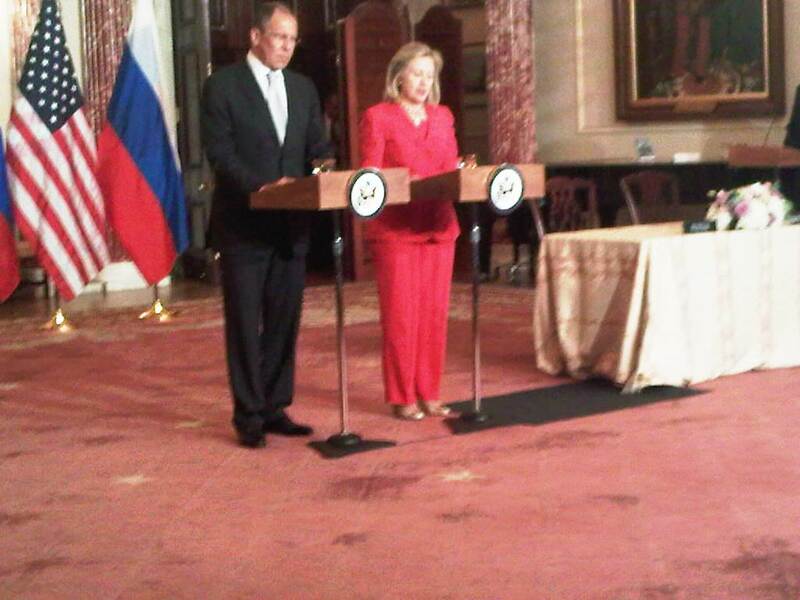 So yesterday Hillary was decked out in red from head to toe for her bilateral meeting/signing with Russian Foreign Minister Lavrov – right down to her red cami under her perfectly tailored suit. She had beige 1/2 inchers and matching necklaces. She was wonderful. I have to invest in a camera that isn’t my blackberry…. I'm pretty sure she was staring right at me here, wondering why the annoying flash on my phone kept going off. She was a vision in blue today, complete with a perfectly matching blue camisole, a sparkly string of pearls, hemmed slacks, and of course, 1/2 inch black heels. 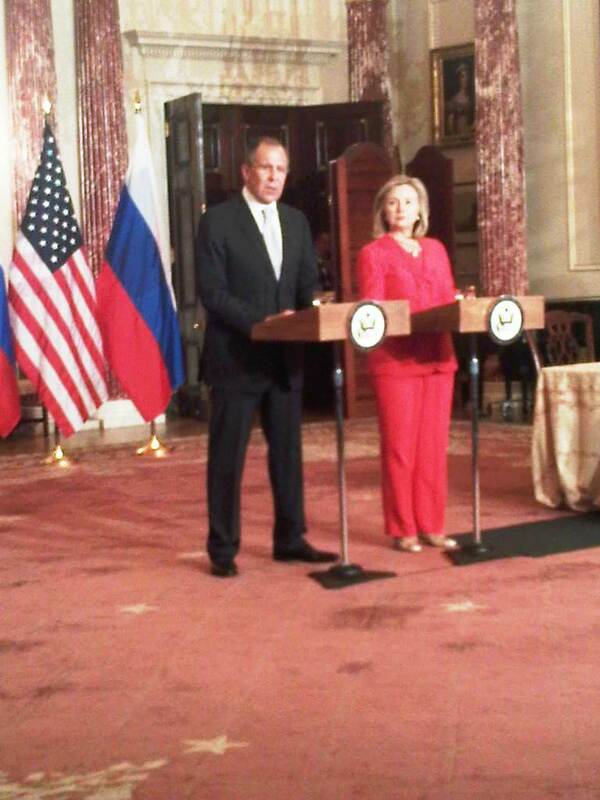 Conveniently, Foreign Minister wore his blue tie. They looked like prom dates! In April 2010 it was documented that Hillary’s salary was $186,600 per year, an amount $4,700 less than what former Secretary of State Condoleeza Rice earned. Upon further investigation, I found that the Secretary of State is a “Level 1” Cabinet position and currently carries an annual salary of $191,300. It seems like a lot, and of course it is, but when you figure that’s what Tom Cruise makes in a month, it puts it in perspective. She works ridiculously hard. She is NEVER home and always non-stop. It amazes me that she’s rarely appears outwardly exhausted and always completely put together. She is always on the clock and always has to be available and alert to answer questions, conduct interviews, briefings, etc. So yes, $190,000 is a lot, but she definitely overworks herself for every last penny! These are blackberry pictures, so forgive the poor quality.